I am a full-time professor at a small, but one of the fastest growing, colleges in Niagara, Canada, teaching photonics (laser engineering) and thin-film technology. I have authored two books on lasers as well as an article in the Kirk-Othmer Chemical Encyclopedia. 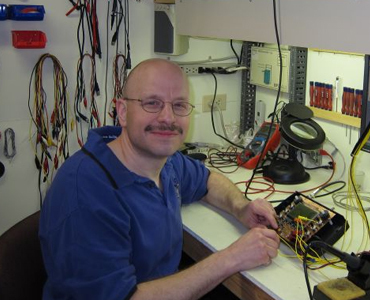 At one time I taught embedded systems design using both MCU’s and DSP’s: that task is now relegated to “hobby” status and in the past few years I have published a few articles in Circuit Cellar magazine. That, pretty much, is what this site is about! Having taught embedded development for many years, and worked professionally in the field as an engineer, I still enjoy electronics and embedded development but now as a hobby, building odd projects (including many for labs at the college). I have a few pinball machines and a homebuilt MAME arcade machine …just click on a few menu items on the nav bar on the top of this page. PHTN1300: Lasers An introduction to light sources (including basic quantum mechanics and spectroscopy), and the fundamentals of lasers (e.g. quantum processes involved, laser gain, optics, etc.). Special attention is paid to the threshold gain equation and applications. PHTN1400: Lasers II A practical look at specific laser systems (including gas, solid-state, and excimer lasers) including an emphasis on details on operational principles. Principles covered in Lasers I are expanded, and include thermal re-absorption loss. PHTN1306: Lasers III Covering the mathematical modelling of lasers (primarily solid-state lasers) to predict required pump energy, power output, and time-domain behaviour. PHTN1432: Vacuum Systems and Thin Film Technology Covering the theory and practice of high vacuum systems as well as application to thin film deposition. Includes physical behaviour of gases and the technology of vacuum systems plus applications including high-vacuum coating systems, gas laser tube filling, and mass spectroscopy. Intensive labs include projects in which students will build antireflective coatings, interference filters, etc. This is an extremely practical course which is the essence of college education: the application of theory to real-world problems and structures. PHYS1630: Thermal Control Systems The use of heatsinks, Peltier-effect thermoelectric coolers, and water cooling to manage heat in electronic and photonic systems is examined. 1This site is hosted on the technology server which has undergone many changes. It all started with an OS/2 Warp box in 1997, migrating to a Sun Enterprise 3500 server from 2001 to 2012, and most recently a generic Unix box after the Sun box finally died.